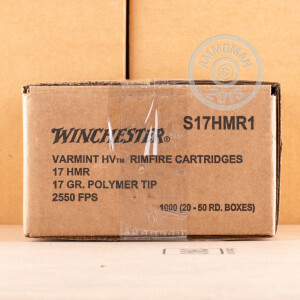 Whether you've gone full "tacti-cool" with an Alexander Arms AR upper in .17 HMR or feel more at home with a traditional Savage 93R-17, you get some of the best varmint-dropping performance available with this ammo from Winchester. 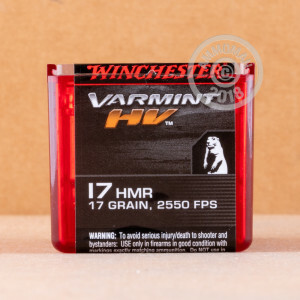 These high-velocity loads pack a great punch for groundhogs, javelina, and other medium-small game. This is not only due to the travel speed, but the V-MAX bullet from Hornady, the creators of the caliber. This 17-grain V-MAX projectile features a lead core, copper jacket, and hollow point which is covered by a polymer windshield. As it enters a game target, the plastic tip will be driven back into the hollow cavity, rupturing the bullet's jacket and causing superb fragmentation. This creates an enlarged wound and transfers shocking energy to the animal's organs in order to effect a quick and humane kill. In addition, the V-MAX tip is tapered to the bullet's body for sleek drag resistance which translates to greater accuracy. 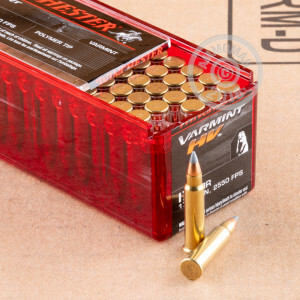 Each V-MAX bullet is secured within a rimfire brass casing which is primed with clean-burning, mercury-free mixture. Buying in bulk with this 1000-round case will give you plenty of ammo for zeroing, practice, and many hunting seasons to come.